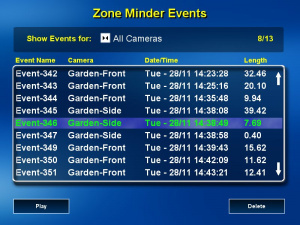 MythZoneMinder is a plugin to interface to some of the features of ZoneMinder. You can use it to view a status window similar to the console window in ZM where you can check the ZM servers status as well as enable/disable a camera, turn on notifications and alter the camera recording function (i.e. 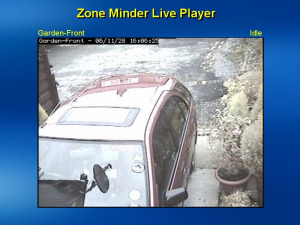 record only on motion detection etc). 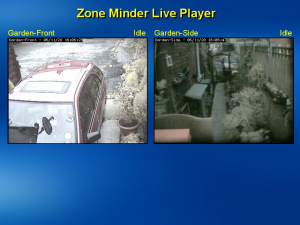 There are screens to view live camera shots showing 1, 2, 4, 6 or 8 cameras and replay recorded events which can be filtered by camera and date. There is also a notification pop-up that can be turned on for each camera that pops up a mini view of a camera whenever motion has been detected. Other features may be added at a later time if there is sufficient interest. The plugin doesn't require any additional dependencies to compile. As with all the plugins you should have compiled and installed MythTV before trying to compile it. added as a parameter when running the configure script. Then compile and install the plugins in the normal way. mythzmserver is a small daemon that should be run on same machine that ZoneMinder is running on. It is a server that responds to request for information like ZMs server status, live frame data, event frames etc from mythfrontends running the MythZoneMinder plugin. The server will be compiled as part of the normal mythplugins compilation and if the server machine is running similar versions of the required libraries then you can simply copy the mythzmserver executable over to the server machine. then simply copy the resulting mythzmserver to a suitable location. You should usually start mythzmserver as a service at boot time. 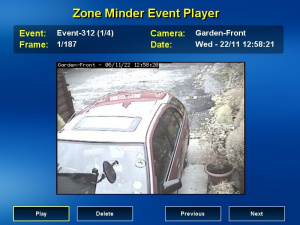 It must be started after the ZoneMinder server has been started. One way to do this is to modify the ZM startup script to also start/stop mythzmserver. The server should be run as either root or as the same user that ZM uses. By default the server will listen on port 6548 and will read the ZM config from /etc/zm.conf if you need to change any of these you can add a parameter to change them. See the README in the mythzmserver source directory for a list of available parameters. The first thing you should do is go to MythZoneMinder's settings page and make sure the settings there are correct for your system. Currently the only settings are for the IP address and port that the plugin should use to connect to the mythzmserver. 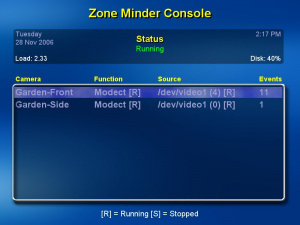 The console screen shows you if the main ZM daemon is running, the current date/time, what the CPU load is and what percentage of the drive used to store events has been used. Below that is a list of monitors/cameras, their current status and a count of how many events are stored for each monitor. UP/DOWN - moves the selected item in the list up down. ESCAPE - exit back to the menu. The live screen shows live views from any available monitor. 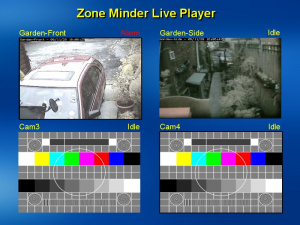 Currently there are views to show 1, 2, 4, 6 or 8 cameras/monitors simultaneously. Above each monitor view is the camera name and the current status e.g. idle, alert or alarm. INFO - switches from 1,2 or 4 camera views. ESCAPE - return to the menu. The event screen shows a list of all stored events. You can filter the list to show events from just one monitor or all monitors and also by date. Events can be played of deleted as required. 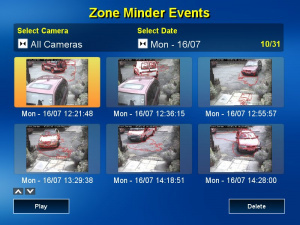 The grid view shows the events list in an image grid with each image being an analysis image showing any movement detected outlined in red. You can switch the grid view to show 1, 2 or 6 images in the grid by pressing the 1,2 or 6 number keys. UP/DOWN - In the camera and date 'selector' widget change the selected item. LEFT/RIGHT - Move focus to the next/previous widget. SELECT - Plays the event if the list or grid has focus or activates all other widgets. MENU - Show a popup menu with options to refresh the events list, switch views and delete all events that match the current filter. DELETE - Delete the currently selected event. INFO - Toggles the event list order. It will remember your chose and use it the next time the event list screen is shown. 1,2,6 - Switch the grid view to show 1, 2 or 6 images in the grid. 0 - Toggle the view between the list view or grid view. The event screen plays recorded events. UP/DOWN - Move focus to the next/previous widget. LEFT/RIGHT - When paused moves the the previous/next frame in the event. PAGEUP/PAGEDOWN - Move to the previous/next event. ESCAPE - return to the events list screen. 1. mythzmserver fails to start with a "This version of ZM is to old you need 1.24.0 or later" error message. - Newer versions of ZoneMinder no longer put the ZM_VERSION in the zm.conf configuration file which mythzmserver uses to configure itself. Simply add the line ZM_VERSION=1.30.0 to the config file which you can find at /etc/zm.conf or sometimes /etc/zm/zm.conf. - If you have just changed any of your ZM monitor sources (/dev/video0 to /dev/video3 for example) you will need to restart the mythzmserver. Find the mythzmserver process, kill it, and restart it. - Try turning off OpenGL playback in the settings panel as this can cause the X server to crash. Remove the need for mythzmserver and use the new ZoneMinder API to access the ZM server directly. This page was last modified on 6 August 2017, at 10:17.